Hey stoners, put down your bong for just a second and check out these posters! 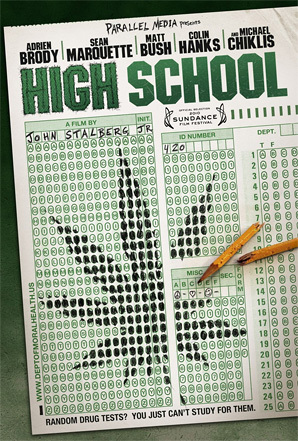 I first came across some of these posters in the press office at Sundance, but just now came across full-size versions of these awesome posters for HIGH School. 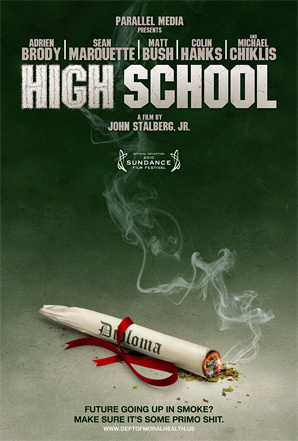 This is the stoner comedy about a valedictorian who gets his entire high school stoned so that he doesn't get expelled. I caught the world premiere a few days ago and totally loved it (read my review). These posters are dead on perfect for the film and I wouldn't even mind seeing them used for its actual release (when it gets picked up), although I don't think the MPAA will approve them. Now blaze up! Description from the Sundance 2010 film guide: "In his debut feature, director/co-writer John Stalberg Jr. percolates his deliriously manic narrative with sparkling energy and deviant characters, joyously ramming his protagonists deeper and deeper into frenzied chaos. HIGH School paints its slacker wit with lush broad strokes, firmly accomplishing the conclusive stoner fantasia run hilariously amuck." This stars Matt Bush, Sean Marquette, Colin Hanks, Michael Chiklis, Yeardley Smith, Mykelti Williamson, and Adrien Brody. It doesn't have a distributor yet, but is looking for one at Sundance. We'll let you know when we hear more! Weird to see Brody in this role. Trailer looked okay. The white poster looks cool. My first movie at Sundance this year. This movie was hilarious! Adrian Brody was fantastic in this! I just got home from a week of Sundance and I'm too tired to really write anything about it but I do recommend it.